The doors displayed on the hoarding add a local touch. As from March 20, vehicles driving into Malta International Airport will be directed to use a temporary route to the terminal building which extends from the current ring road. The re-routing of vehicles will allow the company to start excavation works on an underground link between the company’s multi-storey car park, which is currently under construction, and the existing main car park. At a later stage in the project, a covered walkway will be connecting this link to the terminal building. Malta International Airport kicked off works on the construction of its €20 million parking village in the last quarter of 2018, with the targeted completion date of this project being 2020. The parking village will introduce 1,300 covered parking spaces on the airport campus as well as provide car rental companies with a centralised area of operation. The rooftop of the parking village will be utilised for the installation of a 1,000 kWp photovoltaic system. 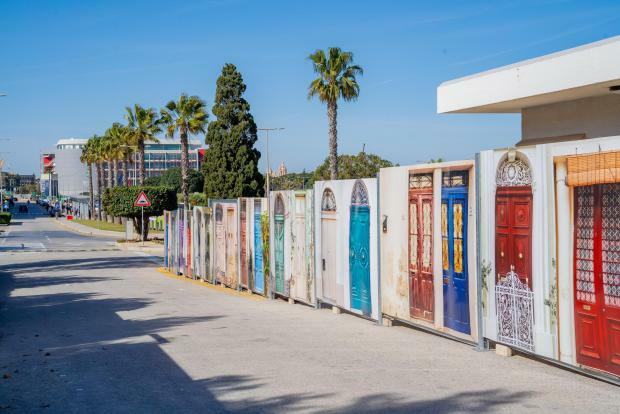 In collaboration with MaltaDoors, MIA has turned the hoarding that is screening off constructions works into a colourful showcase of some of the most beautiful doors and facades of traditional Maltese houses, giving the drive leading up to the terminal building a local touch.